1. I am thinking… about the poor killer whale trainer who lost her life at Orlando Sea World yesterday…and the poor folks who witnessed it. 2. I am thankful for… being able to afford my home. 3. From the kitchen… blueberry biscuit bread (the dogs are obsessed with this!!!). 4. I am wearing… a t-shirt that says: “Not all who wander are lost”. 5. I am creating… a warm and welcoming home, a place for family and friends to visit whenever they like. 6. I am going… to make breakfast in a bit…probably oatmeal, my stomach is iffy. 7. I am reading… a bunch of People magazines my cousin saved for me! 8. I am hoping… my chemo sessions work! 9. I am hearing… Wolf snorting. 10. Around the house… there are quite a few things I love…my grandmother’s bookcase, a Eugene Garin seacape print, my living room rug. 11. One of my favorite things… is a morning cup of coffee, which I haven’t had the last couple days (ran out and haven’t picked any up yet). 12. A few plans for the rest of the week… My new couch is being delivered tomorrow! Hopefully I’ll see a couple friends this weekend, too. I saw this at the Lahey Clinic on Monday…the hallway is lined with paintings of cancer survivors and I loved the bright colors of this one. I love this picture too! Hope your tummy is feeling better this morning. I really like that picture too, the O made into a flower! Sending healing thoughts your way!!! Love you! This is great! I hope your chemo works too. <>. I will play. I’m thinking SeaWorld may be in a bit of trouble since they supposedly got that whale to be used for mating only – it was never supposed to be in the shows. LOVE that picture! It’s so powerful, so empowering and yet comforting at the same time. I want to stand in front of it and soak up its strength. Hope your tummy feels better soon… You should shoot around your house some more so we can see your new sofa. I just love collage–a medium even the last artistic among us can be successful with. 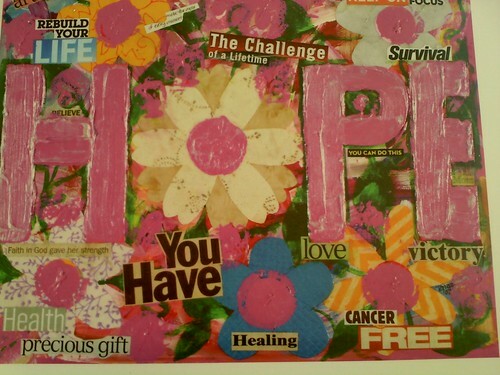 The chemo will work–the blogosphere demands it. I just love it when I can get ahold of some People magazines like that! (I won;t ever buy them, but boy, do I devour them when I get a chance to read them). Here are positive thoughts your way on no. 8. Isn’t no. 5 just lovely! That’s a wonderful collage. Have a great week, Janet. That biscuit bread sounds good. What an inspiring and lovely picture that is. I too hope (and pray) your therapy works also! Thanks for visiting my TT. Had to look for you to respond. Chemo is certainly no fun, and I can’t imagine going without coffee! Enjoy the new couch. Love the collage! Stay strong! I have been thinking of you and hoping your treatments are going well. I love this style of TT, might have to give it a whirl one of these weeks. And I love that you give that yummy looking blueberry bread to your dogs! I think I would eat it all myself–with a cup of coffee, of course! Take care.